SUPPER CLUB SATURDAYS PRESENTS: “A NIGHT OF LOVE” w/ NINI LOVE LIVE! This Valentine’s Day weekend is going to be one to remember at the Idle A While Supper Club And Venue! 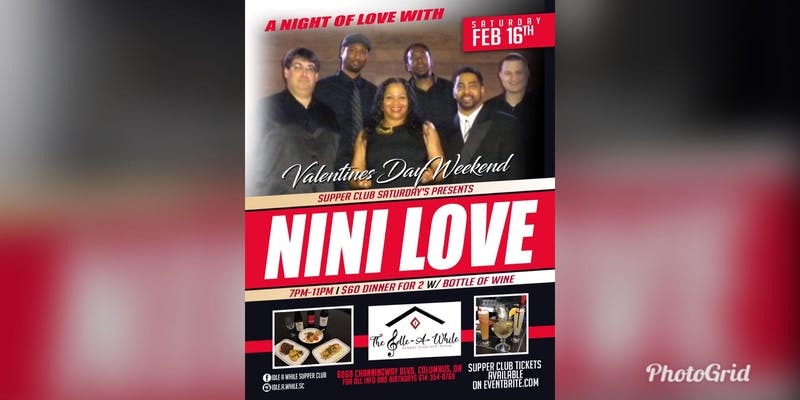 Supper Club Saturdays presents “A Night of Love“ featuring the lovely voice of Nini Love of the Nu-Legacy Band from 8-11pm! On Saturday, February 16th, bring that special person in your life out to hear great music and to also enjoy our full restaurant menu great food & specialty drinks! Admission for 1: $35 – which includes admission, premium seating, choice of meal off the menu*** and a glass of wine or a specialty drink! Admission for two: $60 – includes admission for two, premium seating, choice of meals off the menu*** and a bottle of wine! ***Choices of meals off the menu for this event may vary as it may also exclude some items from our regular menu! And for all info call 614-354-8769!